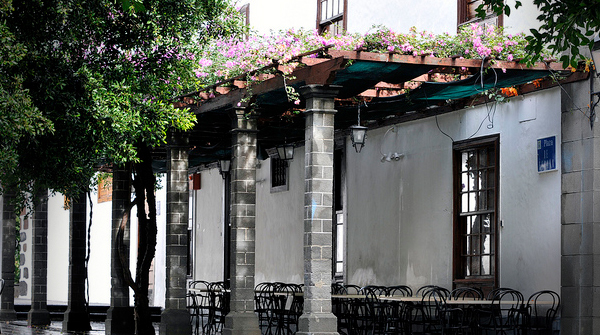 During the day, pergolas provide an open structure that allows for a breeze and streaks of sunlight. At night they can provide an intimate setting to relax in, but lighting needs to be added to make it comfortable. Outdoor pergola lighting ideas range from flexible, easy to install lights such as string lights, tiki torches and table lighting, to solar powered, and then to more permanent low voltage lights. 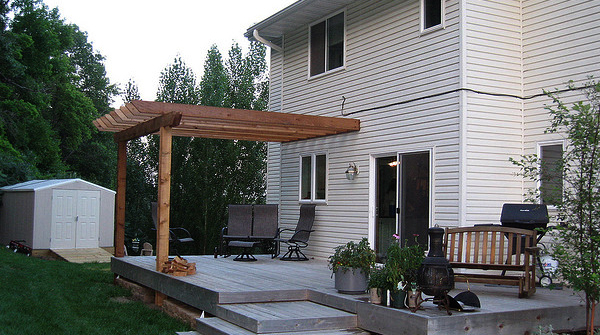 Some of the ideas require construction work, and are ideal for people who are in the process of planning their pergola build or those who don’t mind doing some remodeling work. 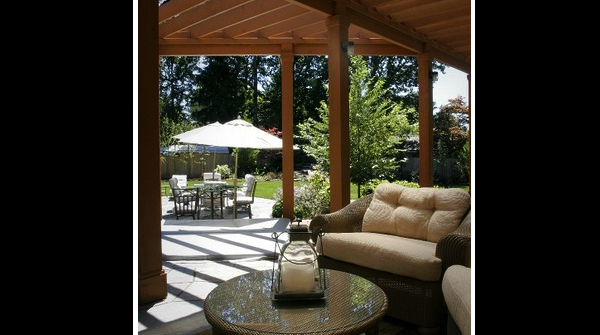 Other design ideas can be easily added onto existing pergolas. The open structure of a pergola, with their columns and cross beams, allows for a number of lighting ideas to be integrated within it. 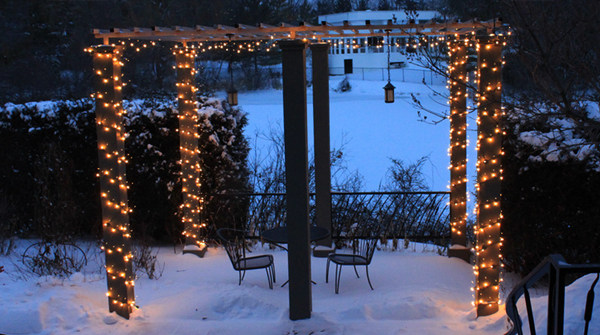 Outdoor string lights are probably the most versatile and easiest lights to use. These can hang down from the cross beams side by side to create a curtain of light or strung across the top to create a ceiling of light (mimicking a starry night). They can also be wrapped around the columns, or intertwined with any climbing plants around the pergola (grape lights can be used to add a decorative flair). These string lights can be solar powered which will be a lot easier to install, or they can be electrical and plugged in. 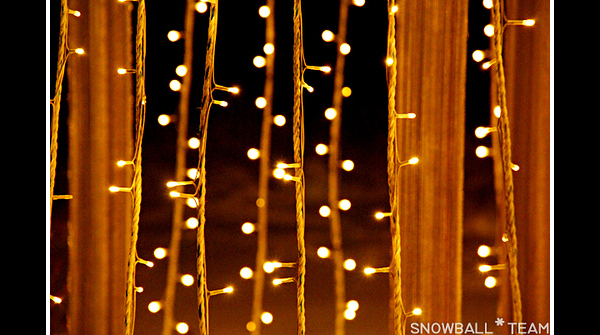 An alternative would be to use globe string lights, which use normal sized light bulbs and provide brighter lighting. They have a more sophisticated look – much like lighting in French cafes. 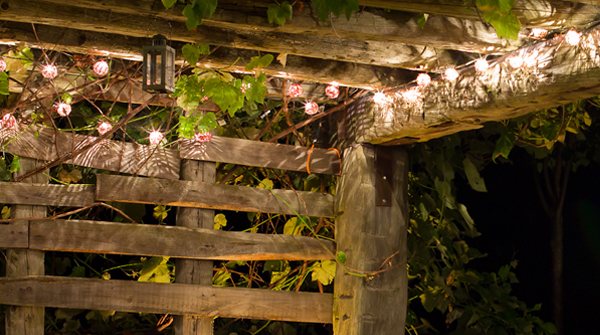 Rope lights are another option for pergola lighting. These are LED lights that are incased within a plastic tube to create a rope of lights. Tiki torches would be simple to install around the pergola. They can be planted into the soil or placed within buckets of sand to be held upright. You can find citronella tiki torches which use citronella oil as the fuel which will act as a natural insect repellent. Or there are more permanent options, made from copper or steel, which will require underground gas piping. 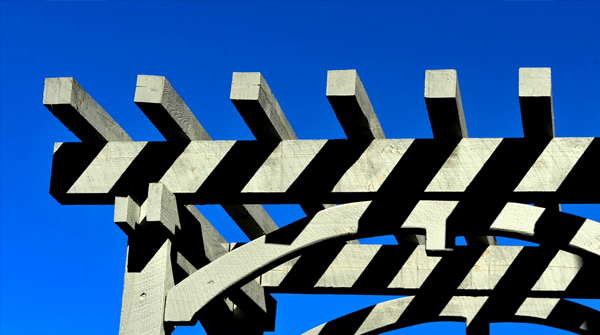 The Posts of the Pergola: The posts can be used for a number of lighting ideas and solutions. Solar light fixtures could be screwed onto any wooden posts. If the pillars, the bases of the posts, are built in concrete or stone, you can have lights installed in them during the building process. Uplights or downlights fitted to the beams will add lighting to the pergola. Solar lights could work as up lights, but electrical light fixtures would be brighter and more reliable. 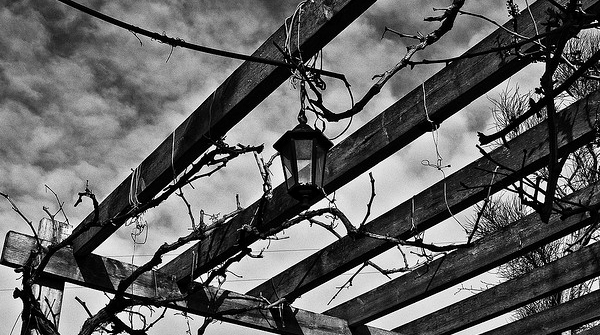 How To Light A Pergola With Outdoor Hanging Lights: There are a number of outdoor pergola lighting options that can hang down from the cross beams. A fan with a light fixture could be hung from the ceiling. 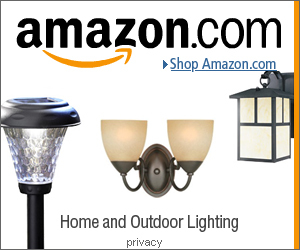 There are also a range of outdoor pendant lighting fixtures that can hang down from the pergola – these include lanterns, mini chandeliers, or semi flush mount light kits (check out the photos below). Outdoor, waterproof paper lanterns could also be hung from under the cross beams. 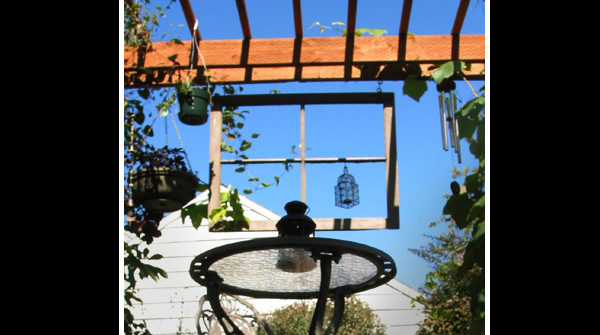 Some DIY pergola lighting options include hanging hooks to the cross beams that can hold up glass jars with candles. These can be taken down and put back up when you need to light and extinguish the candles. Solar powered lights can be hung in the same way. 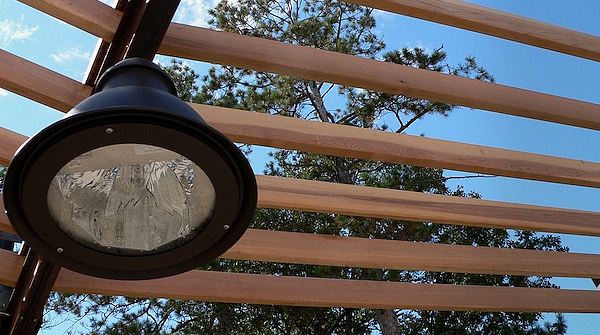 If you are in the planning or building process, recessed lights can be installed into the flooring of the pergola. If the pergola is attached to the house in any way, wall lights fixed onto the house wall will provide lighting. 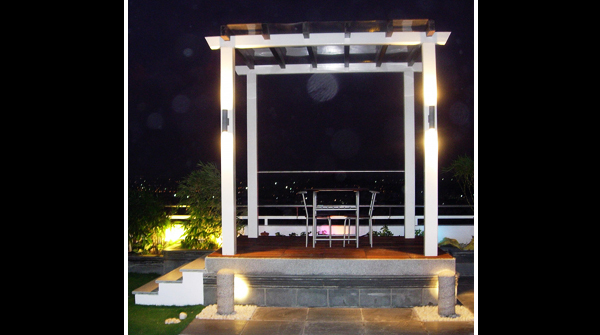 There are also lights that can be used on tables within the pergola. Some tabletop lights include, tabletop tiki torches, fire bowls, or a Sun Jar. 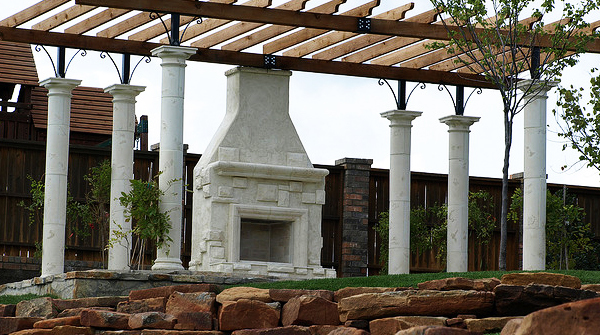 Lighting a pergola can also be done with fire pits that burn wooden logs, oil or use a propane tank.